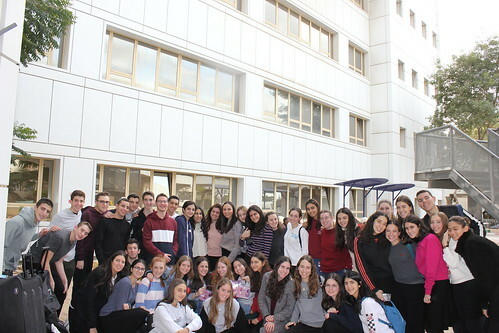 It’s hard to believe that Chesed Mission is coming to an end. We began our last full weekday of Chesed Mission at Yad LaKashish - an organization that teaches elderly immigrants art skills. We gave our scarves and sunglasses to the artists and bought lots of gifts to bring home in the shop. We then drove to Tel Hashomer hospital where we distributed toys to sick children. After a stop for lunch in the Petach Tikvah mall (that does not have fish pedicures), we visited Project Tikvot that helps wounded soldiers through sports programs. We heard from Mayan Berman who was injured in 2002, had his foot amputated in 2009, and went on to become one of the top ten rock climbers in the world championships. He even competed in Israel Ninja Warrior! Then we had a chance to try out the rock climbing walls ourselves, which was a lot of fun! Then we settled in for the drive up to Netanya to Bet Elazraki, an Emunah children's home for children who cannot live with their families. After hearing from the incredible Yehuda Kohn, we watched an emotional film about the children of Bet Elazraki. We then walked across the beautiful complex to the lobby for a performance by the girls and a delicious dinner. We got to really let loose and have a lot of fun with an epic dance party - with a DJ and flashing lights. We paused in the middle to present gifts to the Bar and Bat Mitzvah boys and girls and the program graduates. We got T-shirts to take home as a reminder of the fun we had and the connections we created. We were so exhausted by the time we finished that we were grateful for a long bus ride back to Jerusalem. To cap off the night, a group of us went to a final dinner in Emek Refaim with Rabbi Besser and Rabbi Galpert. We can’t wait for Shabbat in Jerusalem tomorrow!